Take 3 softgels daily. For best results, take with a meal. If you are pregnant, nursing, taking any medications or have any medical conditions, consult your physician before use. Store in a cool, dry place, away from the reach of children. Contains tree nuts (coconut). Just the good stuff. Our vitamins are free of fillers, bulking agents, artificial additives, colors and sweeteners. Group 49 Created with Sketch. Boyle NB, Lawton C, Dye L. The Effects of Magnesium Supplementation on Subjective Anxiety and Stress-A Systematic Review. Nutrients. 2017;9(5):429. Published 2017 Apr 26. Schwalfenberg GK, Genuis SJ. 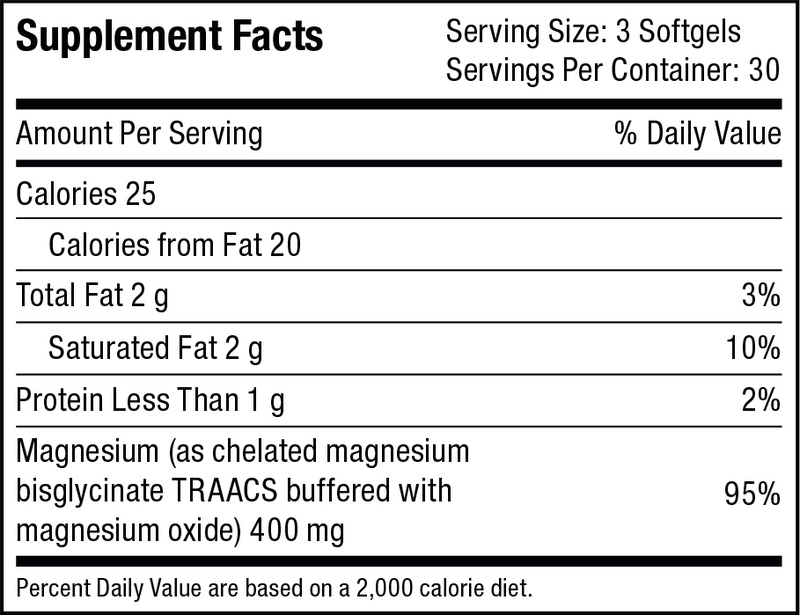 The Importance of Magnesium in Clinical Healthcare. Scientifica (Cairo). 2017;2017:4179326. Bilbey DL, Prabhakaran VM. Muscle cramps and magnesium deficiency: case reports. Can Fam Physician. 1996;42:1348-51. Gröber U, Schmidt J, Kisters K. Magnesium in Prevention and Therapy. Nutrients. 2015;7(9):8199-226. Published 2015 Sep 23. Schuette SA, Lashner BA, Janghorbani M. Bioavailability of magnesium diglycinate vs magnesium oxide in patients with ileal resection. JPEN J Parenter Enteral Nutr. 1994 Sep-Oct;18(5):430-5. We know you have a lot of choices when it comes to vitamins. Here’s how we’re different. We scour the globe for the most effective ingredients, both natural and lab-grown. Bonus: they’re in forms that your body can actually use. We consult registered dieticians and biochemists to ensure that our formulas are balanced, effective, easy for your body to absorb and complementary. We verify ingredients and every batch of finished goods using in-house and third party labs. We’ll never use fillers, bulking agents or proprietary blends. You can trace every single batch we make on our site! We’ll show you what goes into your vitamins and how they did in our quality tests (hint: flying colors). We stand by our quality! If you don't feel a difference within 30 days, let us know and we'll refund you in full, even if your bottle is empty.